A storm rages as I write. 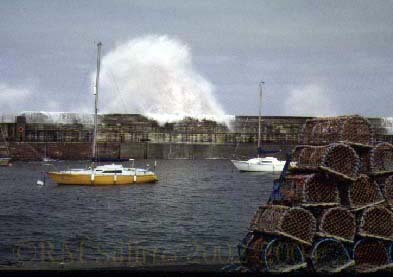 Waves crash against the harbour wall, towering in the air "until the sea and the sky, the waves and the clouds, [are] mingled together as one".But this storm is as nothing compared with the one that erupted inDunbar in 1993-94 when the public began to notice that a visitor centrehonouring John Muir was proposed for Linkfield, an unpolished openspace behind the saltmarsh at Belhaven Bay. As far as I can gather, the proposal had originated in 1988, the year when Dunbar magnificently 1hosted a meeting of the John Muir Trust on the 150th anniversary ofJohn Muir's birth. To mark the occasion, Dunbar schoolchildren wrote tothe heads of 150 countries, asking what they were doing to protecttheir environments. The letters were posted in the presence of thePresident of the Sierra Club, in the post-box near the house in DunbarHigh Street where Muir was born. Replies from about 30 countriesdelighted the organisers, educationists Don Bracewell and Graham White,and they conceived a vision of Dunbar as the hub of a world-wideinformation exchange about environmental issues relating to the life'swork of John Muir. With the support of many local people alreadyinterested in Muir, and a grant from Blue Circle Cement, they put aproposal to East Lothian District Council (as it then was). Unfortunately,councillors and officials latched onto a supporting statement that theproject would bring tourists to Dunbar. This became the primeobjective: Linkfield would be a most attractive spot for all sorts ofactivities and entertainments. Five years later plans for a John MuirEnvironmental World, there, were ready for public consultation. These plans were very far from what Don and Graham had envisaged, but they were not the only people to be distressed by them. A hundredpeople turned up at a meeting in the Corn Exchange, chaired by Richard Holloway, to support (most of them) a motion to the effect that, yes, we do want a John Muir visitor centre but it should be in the town itself and not in an unspoilt part of the John Muir Park. Bythe time the plans were finally abandoned, in February 1994, harsh words had been spoken and East Lothian District Council was thoroughly disgruntled with the people of Dunbar. The next step came from the John Muir Trust, a rapidly growing nation-wide charity "dedicated to acquiring and sensitively managing key wild areas", particularly in north-west Scotland. In December, 1993, the Trust had been told that the District Council would welcome alternative proposals for a visitor centre, and Trustee Ben Tindall produced a set of principles to be taken into consideration. He presented these to about 70 local people at a public meeting in Dunbar Grammar School on 24th March, 1994. Ben's father, Frank, had been the inimitable county planning officer for East Lothian. An enthusiast for John Muir, Frank had initiated the processes which led to the museum on the top floor ofDaisy Hawryluk's property in the High Street and to the designation of the John Muir Country Park. Ben's presentation was followed by an animated discussion, with half a dozen people offering suggestions about a suitable site for the Centre, most of them involving some building whose owners were finding it difficult to maintain. It was agreed that those who were willing to form a steering group should meet again in a month's time, with John Muir Trustee Carole Ross again in the chair. Meanwhile Don Bracewell, Trustee Maude Tiso and Stefany Hawryluk visited LEEL, the Lothians & Edinburgh enterprise company, seeking funding for a new feasibility study. They had a distinctly cool reception. By the end of the evening, we had decided to form a properly constituted Association to take the project forward, and 7 Dunbar residents had been appointed to form a working party along with a few from the John Muir Trust's information and education committee. Thinking back to this meeting, I can still see David Anderson, Stefany Hawryluk, and Pauline Smeed excitedly discussing the old people in the town who might have known someone who knew John Muir. Duncan Smeed on the other hand was signalling, to a rather resisting audience, the importance of making use of the Internet 2.This was in the days before e-mail was widely used, the world wide web of 'cyber space' was in its infancy and Duncan was professionally involved with helping it grow. My other vivid memory is of the valuable advice given by Bill Gardner, then in the throes of trying tofind funding for his own vision of a Seabird Centre in North Berwick. In the end, there were 14 of us, assigned to various tasks. The group as a whole met three times, the first in the wonderful atmosphere and comfortable chairs of the council chamber in Dunbar Town House, thanks to Dan Cairney. For the others, thanks to Stefany, we sat on the rickety chairs of the 'video room' on the top floor of the John Muir House (a name which had to be changed years later when a new East Lothian Council decided it would be more appropriately applied to the Council Buildings in Haddington!) My memories of these meetings were misty, but I've just looked out the reports I made at the time as interim secretary. The enthusiasm and hard work put into this project by so many people impresses me all over again. By the 20th of June everything seemed to be in hand for an inaugural meeting on 27th July. Just two hitches occurred between these dates:first, the Inland Revenue did not like the stated aim in the draft constitution - "to establish a John Muir Centre in the Dunbar area". Graham thrashed the matter out with them and arrived at the rather pompous version we finally adopted. Then, soundings among 'the great and the good' failed to find a potential President, and we began to despair -- until one morning I heard Professor Fred Last, a member of the Intergovernmental Panel on Climate Change, talking on Radio Scotland about flowering times in his EastLothian garden. Problem solved! Fred replied favourably to Don's letter, attracted by the emphasis on biodiversity and sustainability, buzz-words Graham had inserted in the constitution. We were only looking for a figurehead, but Fred, like the rest of us, gave unstintingly of his time. His reputation and wide experience were to be invaluable in gradually overcoming the antagonism of LEEL and the District Council in the years ahead. So Dunbar's John Muir Association was duly constituted, under the chairmanship of Don Bracewell, by 53 people meeting in the hall of Our Lady of the Waves. When its newly elected council met immediately afterwards, it was a shock to learn that Don was leaving Scotland and would not accept the office of convener. He proposed me instead -- but that's another story. 2 I think he called it the 'information super-highway' in those days.